Here’s two more observations in this third instalment in my growing commentary on the relatively well-know Murray composition. You can read the other two here and here. Firstly, here’s another quote from Murray distancing himself from Ayler as a direct influence. What’s also interesting in this is the revelation of how assiduous the young Murray was in mastering the techniques and solo virtuosity of tenor players from the jazz tradition. Secondly, an observation on the confusion caused by two early David Murray recordings, which intentionally or not share the near same title. 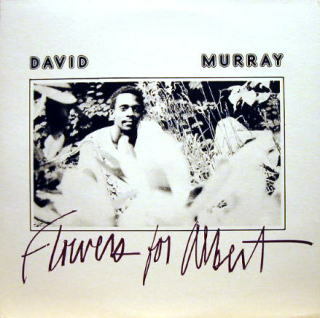 Murray’s first recording as a leader was released as Flowers for Albert. Made on June 26, 1976 live at The Ladies’ Fort loft in New York, featured David Murray on tenor, Olu Dara on trumpet, Fred Hopkins on bass, and Phillip Wilson on traps, and was released on India Navigation label. With a bit of hunting you can get hold of original vinyl copies or the later double CD with extra tracks. Three days later Murray was recorded in the studio, with the same band less Dara, and the results issued on Adelphi as Low Class Conspiracy after one of the tracks. This is a surprisingly difficult lp to track down and didn’t make it to CD. 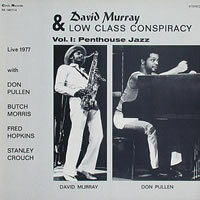 A year later the title Low Class Conspiracy was used as the band name on two releases on Circle Records entitled Live Vol 1: Penthouse Jazz and Live Vol 2: Holy Siege On Intrigue. The band is now David Murray (ts), Lawrence “Butch” Morris (c), Don Pullen (p), Fred Hopkins (b), and Stanley Crouch (d). The lps come up quite regularly on eBay, although many retailers ask rather a lot for them. 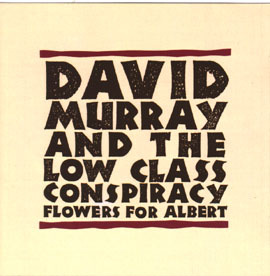 These tracks were released in 1990 as a CD by West Wind as David Murray and the Low Class Conspiracy Flowers for Albert. This is relatively easy to track down. Of course all serious Murray fans will want all the records, but you can easily end up buying the same things twice as discographies often use the cover for the last CD to stand in for the first. There’s a David Murray housepoint for each mistaken use you spot. I’m sorry… but people still say ‘traps’?